How to keep footer sticking to the browser??? developer must have it as the basic and a very important requirement before he/she starts his website design. 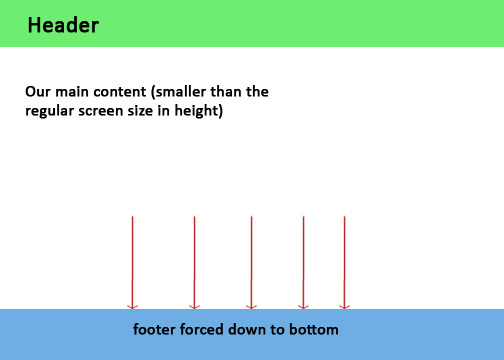 This topic will teach you how you can have your website footer stick to the bottom of the browser. 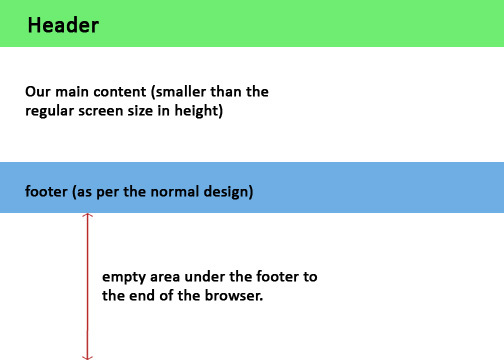 Specially this case might be a challenge in case your page size is smaller than the computer screen where u might have the footer to appear wiered and does not makes a look as it looks different in different screen size. If u have a webpage that has the size of the screen and browser then just hit F11, you will notice the issue i am referring to here.. So to have this issue solved, i advice every one that you look for this as u start your design rather than searching a solution after the design is complete, because as the design gets done we might have to change the structure of the whole page layout as per the solution’s requirement. So look for this before you have your start. Okie let me jump in to the ral issue here, first for those who might have not understood the issue let me brief with a simple diagramatic presentation which will help you out comprehensively..
now as we apply the technique through our CSS, we might have it solved as is shown below..
this is it we are done, but hold on we have to make it compatible with all other browsers, right?? ?